Every three years, the California Energy Commission (CEC) revisits its energy efficiency standards, augmenting the building code to align with recent technological advancements and the state’s new efficiency goals. The commission underwent this process again this year, identifying areas for improvement in both new construction and retrofits for residential and nonresidential properties. This entry was posted in Santa Cruz Architect and tagged building energy, Building Energy Efficiency Standards, building permit processing, net zero building, net zero energy, NZE, NZEB, passive solar on November 18, 2016 by santacruzarchitect. Detail of Vega House, an NZE home located in the Santa Cruz Mountains. 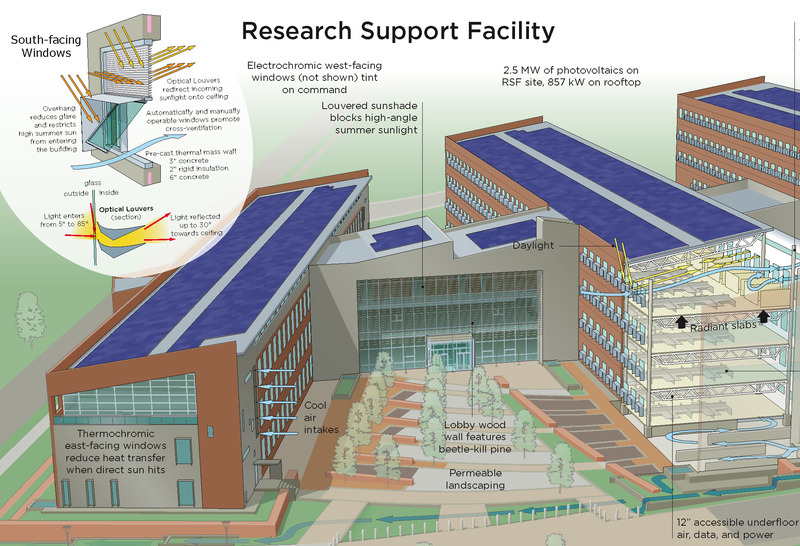 Net-zero simply means that a building produces as much energy as it consumes. 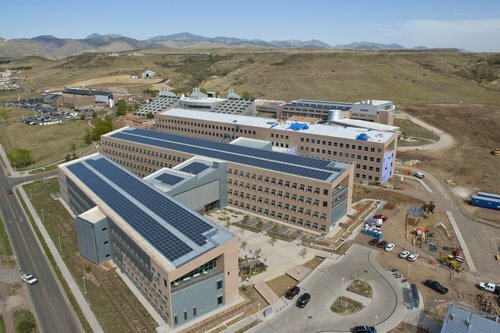 Net-zero energy buildings (NZEBs) minimize energy use through efficiency and by meeting remaining needs through renewable energy sources. Because NZE is a relative newcomer to the construction industry, it behooves all involved to be well-educated as to the steps necessary to successful design of the NZEB. The acid test of whether a NZE home is performing as intended generally comes an entire year after it’s constructed, when the first year of energy bills are evaluated. By then it can be far too late to correct any deficiencies in the design. Moreover implementing NZE strategies, if not done cost-effectively, can completely erase potential energy savings (operating costs) due to excessive construction costs (initial costs), thus resulting in a failed building from a costs-benefits standpoint. To help avoid these pitfalls we’ve outlined the following ten steps towards the affordable Net-Zero Energy Home. Santa Cruz Style concept house. South facing glass is optimized, while excessive solar gain is controlled by exterior shading devices such as eaves and trellises. 1. It begins with the Design Process: The first step towards the affordable NZE home begins with an integrated design process, a team approach ideally including the owner, builder, architect and an energy consultant. Obtaining a cost-effective NZE home requires that a vast array of design decisions, many normally deferred until relatively late in the design process, be effectively identified and decided right from initiation of the design. To do this effectively requires hands-on involvement from all parties, including the owner whose job it is to make the decisions, the contractor advising on cost-effective options, the analyst verifying major decisions with energy modeling, and the architect facilitating orchestrated design decisions towards the optimal result. 2. The Site: For the most cost-effective NZEB, site selection must consider climate, weather patterns, wind, sun exposure, shade, heating/cooling degree-days, and topography. Ideally one should choose a site with a long east-west lot line to allow design imperatives such adequate south-facing roof for solar collectors and south facing windows for solar gain. The site should be free of obstructions such as trees, neighboring homes, and land-forms interfering with solar access. A solar analysis is an important tool for evaluating passive solar, solar photovoltaic (PV) and solar thermal (hot water) potential by objectively measuring a site’s limitations for solar gain potential. Taking full advantage of the solar potential for each site is one of the most cost-effective strategies for achieving the successful NZE Home. 3. The Basis of Design: After the site analysis has been concluded, the next step is for the project team to collaborate with the architect in preparing the NZE’s program brief. The “Brief” is simply a detailed, itemized list of the strategies to be implemented for this particular home on this particular site to achieve the intended goals. It thus serves as a checklist or “road map” for the project. 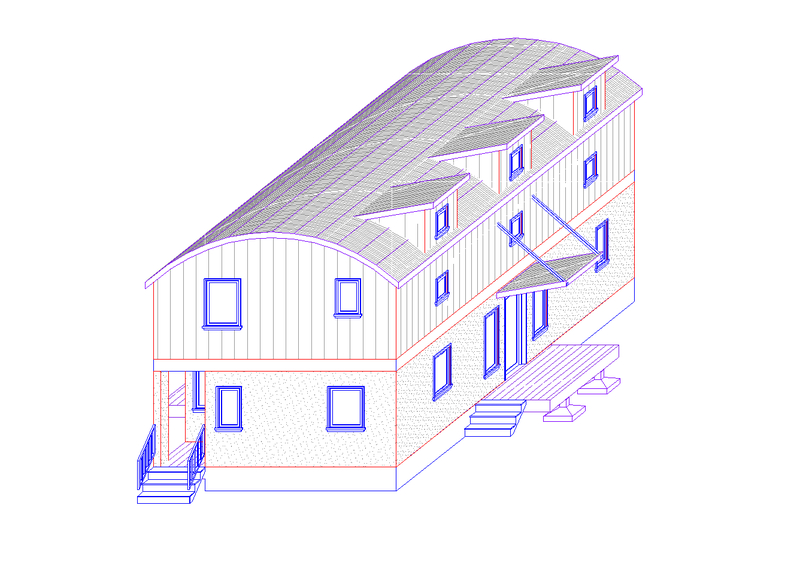 The Brief encapsulates key components and measures such as the building’s area, projected construction budget, size and characteristics of various rooms, appropriate construction type for foundation, walls and roof assemblies, targets for appropriate ratio of floor area to percentage of window glazing, and targeted sources for renewable energy. Santa Cruz Style concept house: a Net-Zero Energy home can be both contextual and high performance. 4. Size and Shape Matter: When contemplating the design and construction of an affordable NZE home, size and shape matter. Smaller homes use less energy for space heating and cooling, thus reducing operating costs. The savings from building, say, a 10% smaller home that achieves the same level of comfort and livability as a standard home represents a significant lowering of the cost construction, thus improving the bottom line right from inception. The well-known strategies of the Not So Big House movement can be used to result in a smaller home designed to look and feel larger,more spacious and comfortable without wasted space, resulting in a smaller home which functions as well as a larger home without unnecessary expense. Shape is also important. For example, an axially arranged organization of rooms will increase the surface area available for south-facing windows, optimizing opportunities for passive solar gain as well as daylighting. Similarly a thin organization of rooms will increase opportunities to cross-ventilate the home, thus facilitating passive cooling. An east-west oriented, axial arrangement of rooms. 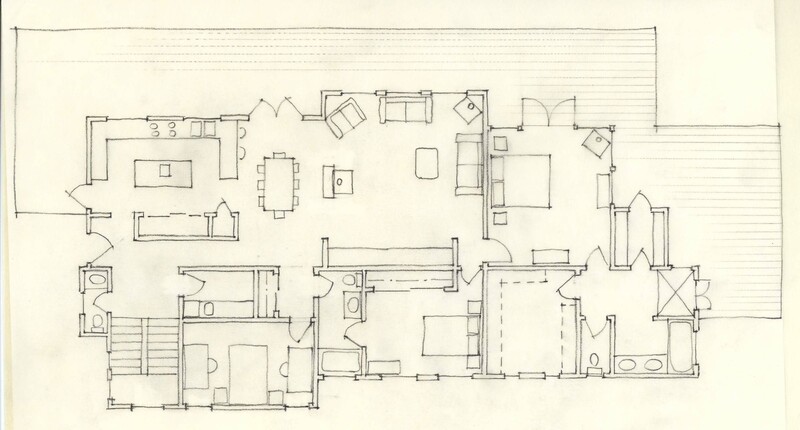 Design sketch: Sun & Sky House, 2011, built in the Santa Cruz Mountains. 5. Design to use the sun: To be successful, NZE homes must be designed to take advantage of the sun’s energy to the greatest extent possible, using it for example as the energy source for passive solar gain, generating electricity, and collecting solar hot water. After site analysis the conceptual model of the home can be appropriately located and massed appropriate to climate and site conditions, allowing mapping of potential energy performance and energy savings from the start. Using this data the total area of southern-facing glazing will be determined – generally speaking it’s better to have too much rather than too little south-facing glass since excess solar gain can always be mitigated, but there is no remedy for inadequate amounts of glass. Once the appropriate amount of glazing is determined, control features such as eaves, light shelves, trellises, horizontal louvers, brises soleil, external shades and shutters, and glass selection are used to fine tune performance to avoid excessive heat gain in the summer and optimize solar heat gain in the winter. The design effort can then focus on the non-solar energy sources contributing to the overall energy picture by quantifying photovoltaic, solar hot water and other on-site renewable energy sources necessary to balancing the NZE home’s energy equation. With a responsible design approach, the NZE home need not be type-cast into a traditional architectural style. 6. Design for added insulation: Think of the home as a six-sided box in which all six sides need to have the most cost-effective insulation specific to the project need. 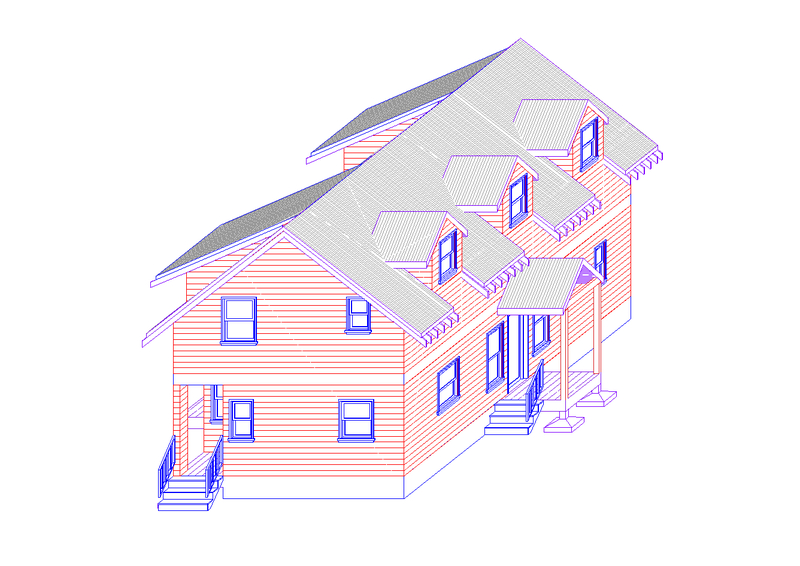 R-value is the unit of measure for insulation, and R-values on each side of the box, as determined by energy modeling, must meet but not exceed the net-zero energy goals. Once NZE goals are meet, surplus insulation in excess of project needs is not a cost-effective use of resources. Features such as thicker walls, deeper floor framing assembly or slab-on-grade, and raised roof-truss heels may be incorporated in the design to accommodate the appropriate insulation. Here in coastal California, the design issues are relatively less challenging. 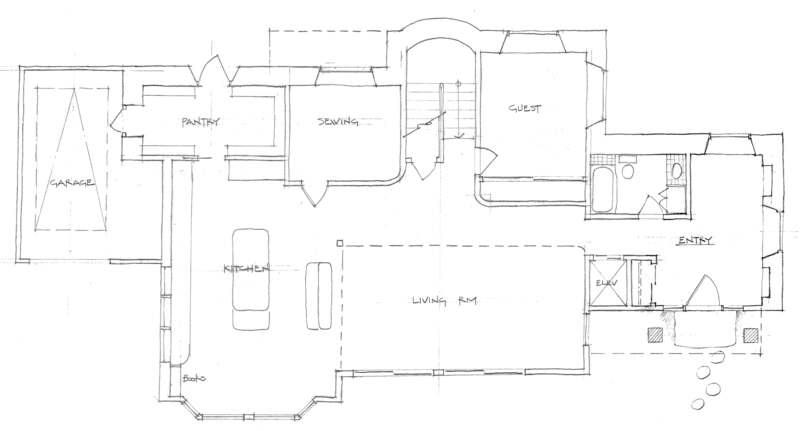 Nonetheless, as with any other aspect of the design, it is important that these strategies be weighed, decided upon, mapped, and incorporated into the design documentation to ensure that the subcontractors on the jobsite understand unambiguously the design intent and how it is to be built in order to ensure success. More challenging climate zones such as inland California, the Mountain States and Midwest may require measures such as 8-inch to 12-inch thick, off-set stud walls to provide for adequate insulation. Moisture related issues must also be considered in the design of the highly insulated and airtight building assemblies of the NZEB. Designing assemblies that are both breathable and airtight prevents moisture-related issues in the realized building. Detail for attachment of outboard rigid insulation to limit thermal bridging. Courtesy Segal & Strain Architects, Emeryville. 7. Minimize thermal bridging: During the course of the design thermal bridging must be eliminated as much as possible from all six sides of the six-sided box. A slab-on-grade foundation system for instance is always placed atop an insulative barrier separating it from grade. 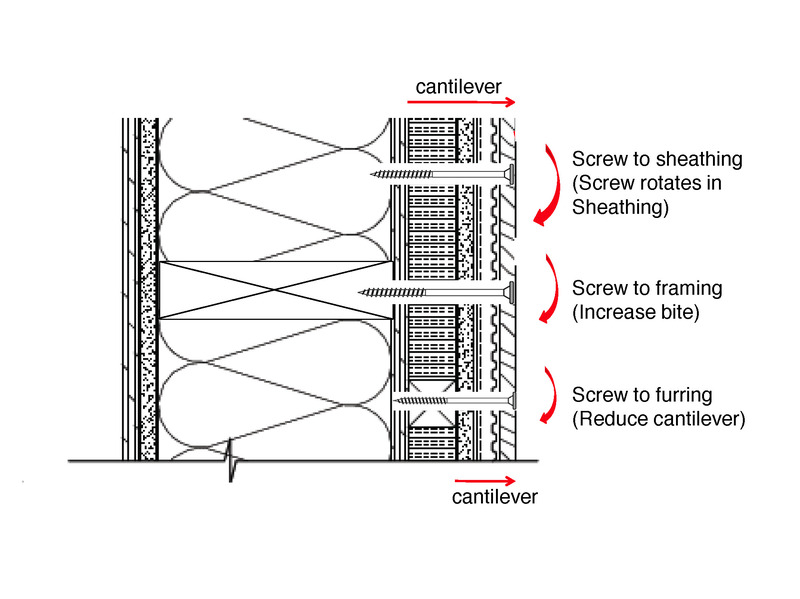 In conventionally framed walls, every nail, every screw, and every stud in the wall assembly is a potential thermal bridge. For this reason advanced framing using offset studs are coming into favor. An alternative is the use of outboard rigid insulation, which must be carefully detailed if thermal bridging is to be avoided. 8. Windows and doors: If the NZE home is a well-insulated, highly airtight, “six-sided box,” windows and doors are relatively poorly insulated “holes” in that box. Moreover they are far and away the most expensive element in the wall assemblies that make up that “box”. 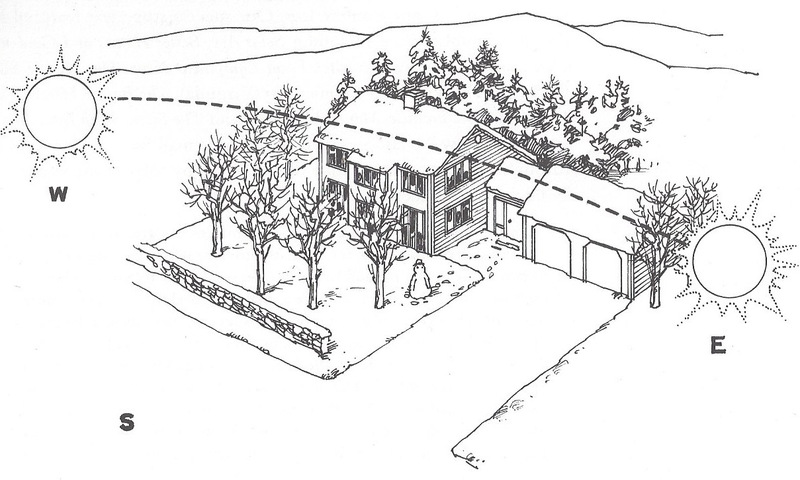 For these reasons optimizing the location and size of openings is among the most important design strategies for achieving the affordable Net-Zero Energy Home. Generally, most glazing will be south-facing, with lesser amounts allocated to east and west facades. North-facing glazing will be minimized. The exact ratios will be evaluated, determined by the energy modeling, and captured into the design documents. In terms of detailed requirements and by way of example, casement and fixed windows are less susceptible to infiltration than sliding, single- or double-hung windows. Fewer, larger windows are more energy efficient and more cost effective than more, smaller windows because there is a higher glass-to-frame ratio in larger units. 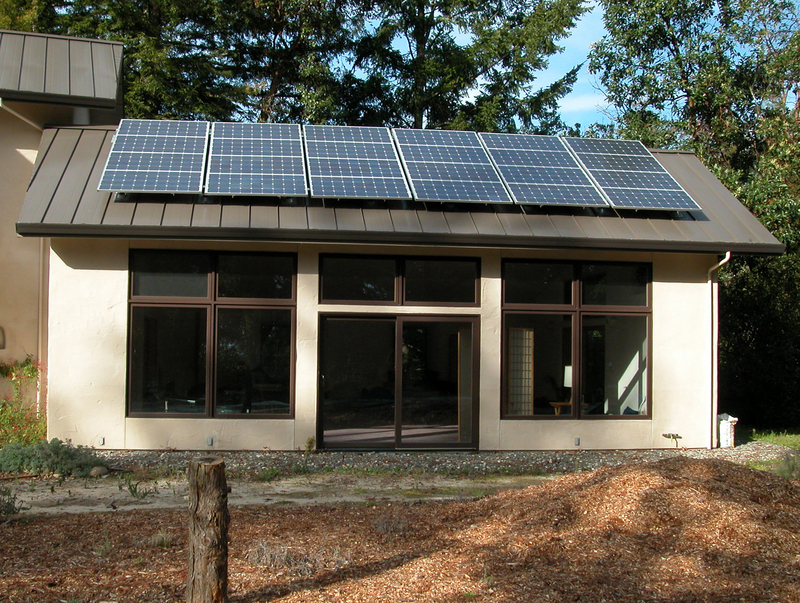 Kumin Residence, an off-the-grid, passive solar home utilizing strawbale construction. Designed in 2003. 9. Alternative Construction Technologies: Although conventional wood framing and it’s derivative, advanced framing (a.k.a. optimum value engineering) are most commonly in use, many other construction technologies lend themselves to NZE. Systems which might lend themselves to a satisfactory result and which might be considered include timber framing, Structural Integrated Panels (SIPs), Insulating Concrete Forms (ICFs), Wood Waste Masonry, strawbale, rammed earth, PISE, and traditional wattle and daub techniques. In each case the technology of choice will be a function of the owner’s preferences, the builder’s familiarity and comfort level with the technology, and the costs-benefits accruing to its implementation specific to the project. 10. Design for builders: Given that the NZEB is a relatively newcomer to the construction scene, a great many of the kit-of-parts contributing to the successful NZEB will benefit from reality-checking for constructability and cost-effectiveness to build from an experienced contractor. For this reason, as mentioned previously, we generally encourage bringing the builder on board early in the design process, when ground-floor decisions informing subsequent stages of the design process are being made. Although not an absolute essential, having a contractor either as an integral member of the design team or in a consulting capacity will facilitate cost-effective decision-making right from project inception. 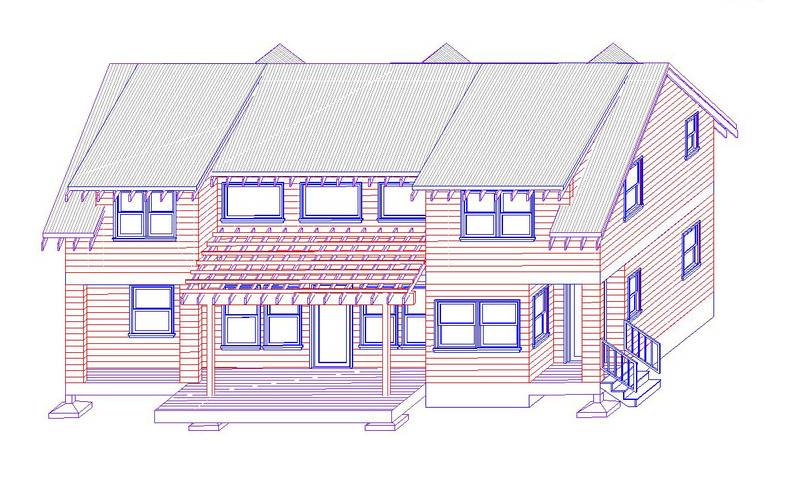 While building an affordable Net-Zero Energy homes is within reach of anyone who is in a position to commission a new or remodeled home, the too-be-desired results – namely affordable initial (construction) costs plus high return on investment in the form of low recurring (energy) costs – requires a host of sound decisions, systematic design and documentation, and a concerted, diligent construction effort to realize. We hope the foregoing 10 points have provided you guidance towards that end. NZEB is one of many aspects of sustainable practice with which we have experience. To see more examples of our work in green building design click HERE. This entry was posted in Santa Cruz Architect and tagged net zero building, net zero energy, net-zero energy building, NZE, NZEB, passive solar design, Santa Cruz Architect, sustainable building practice, zero-energy building on July 18, 2014 by santacruzarchitect. Updated 2013 Building Energy Efficiency Standards (Title 24) took effect July 1 in California. 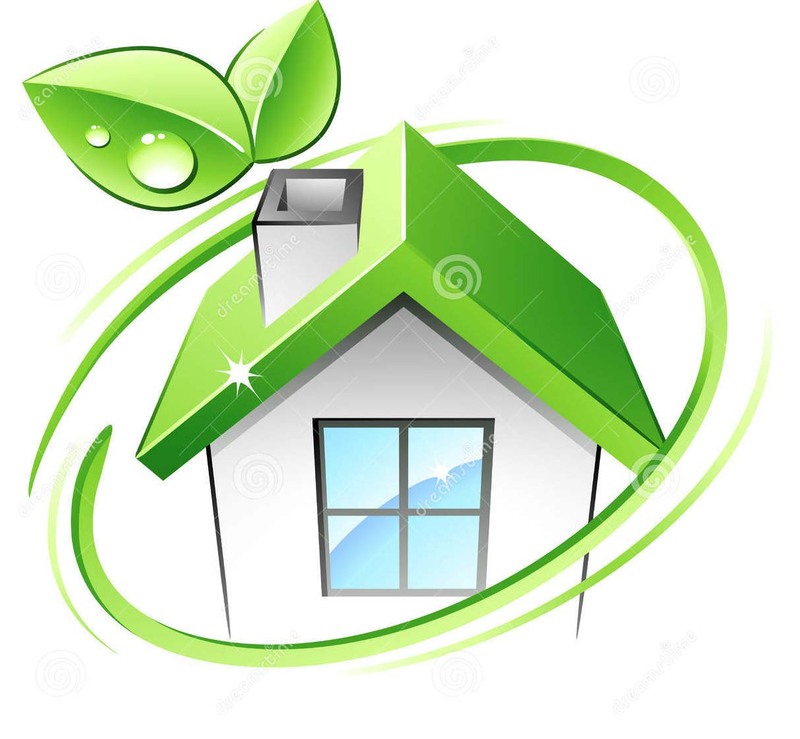 Designed to obtain improved energy savings from new and existing residential and nonresidential buildings, the updated standards are intended to result in 25 percent less energy consumption for residential buildings and 30 percent savings for nonresidential buildings over 2008 Energy Standards. The 2013 standards update for lighting, space heating and cooling, ventilation, and water heating are anticipated to add approximately $2,000 to the average cost of a new residential building construction. Estimated energy savings to homeowners, however, is estimated at over $6,000 amortized over 30 years. In total, the standards are estimated to save 200 million gallons of water (equal to more than 6.5 million wash loads) and avoid 170,500 tons of greenhouse gas emissions per annum. Insulated hot water pipes to save water and energy, and cut the time it takes to get hot water. Improved window performance to reduce heat loss during winters and heat gain during summers. Whole house fans when appropriate, to reduce the need for air conditioning. Improved wall insulation to reduce heating and cooling loads in all climate zones. Mandatory duct sealing in all climate zones. Mandatory solar ready zone to facilitate future installation of solar systems. Recognizing photovoltaic compliance credit for the first time in the building standards. High performance windows that reduce heating and cooling loads in buildings year round. Efficient process equipment in grocery stores, commercial kitchens, data centers, laboratories, and parking garages. Advanced multi-level lighting controls and sensors to minimize the usage of electric lighting by taking advantage of available daylighting and demand response opportunities. Occupant Controlled Smart Thermostats allow for setting and maintaining a desired temperature and voluntarily participation in a utility’s demand response programs. Increased solar reflectance for low-sloped roof to reduce cooling load in summer time. Increased cooling tower energy efficiency and water savings by requiring drift eliminators and other water saving measures. Standards for all types of buildings require “solar ready roofs” to accommodate future installations of solar photovoltaic panels. This is the first time photovoltaics are included as a compliance option. To help the industry meet the 2013 standards, the Energy Commission developed public domain software to assist with compliance. The California Building Energy Code Compliance (CBECC) software is a free, open-source program that models residential and nonresidential buildings, giving businesses a better understanding of what is required to be in compliance. The CBECC platform is said to provide more consistent simulation results, and facilitates compliance analysis within third-party building energy design tools. In addition to CBECC, there are three additional vendor software programs to help designers, builders and others measure and evaluate results. Their web address for access is: http://www.energy.ca.gov/title24/2013standards/2013_computer_prog_list.html. To learn more about the 2013 Title 24, Part 6 Building Energy Efficiency Standards you can visit their website: http://www.energy.ca.gov/title24/2013standards/. This entry was posted in Santa Cruz Architect and tagged building energy, Building Energy Efficiency Standards, net zero building, net zero energy, NZE, NZEB, sustainable building practice, zero-energy building on July 8, 2014 by santacruzarchitect. A reader recently queried in response to our recent posting The Brave New World of Insulating Wall Assemblies, “will adding exterior insulation act to decrease the probability of a condensation issue”? The short answer is, adding exterior insulation will always decrease the risk of condensation within the wall assembly. That said, in the design of the entire wall assembly including insulation in the stud bay + outboard insulation, we want to design the whole assembly with the dew point outboard of the wall sheathing. That way condensation, in the rare event it does occur, does not take place within the stud bay. The chart at right provides recommendation for balancing the insulation. In a commercial application we can assume indoor RH of 35%. In Santa Cruz, the average for the coldest three winter months (Dec, Jan, Feb) is 49.7 degrees. Cross-indexing these (35% x 50 deg F) results in 0.00. In other words, in our climate zone since temperatures are mild, insulation balancing is not likely to be a consideration. The most conservative estimate might assume an indoor RH at the highest end of the spectrum i.e. 60%. In the same temperature range (50 deg F) this results in a 24% ratio for the exterior insulation. 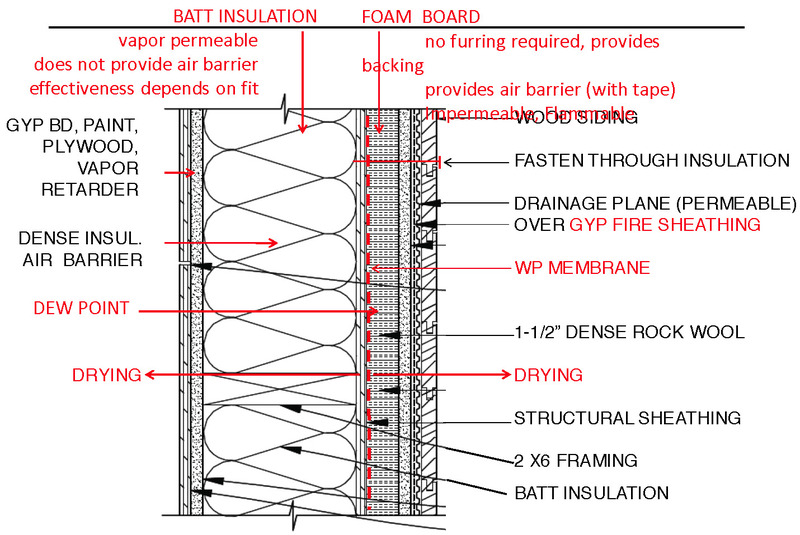 If we seeking to attain an R-20 wall this means it’s recommended to design R-4.8 into the exterior insulation, and the remainder (20.0 – 4.8 = 15.2) in the cavity. Using conventional insulation, options might include: A. R14 batt + R6 rigid = R20 target B. R19 batt + R1 rigid = R20 target. Since the ratio is less than 24%, Option A is the better of the two, since it is the least likely of the two option to result in condensation within the cavity. There is a detailed and comprehensive article at Building Science.com: http://www.buildingscience.com/documents/digests/bsd-controlling-cold-weather-condensation-using-insulation. It’s author, Dr. John Straube of the University of Waterloo, is widely considered to be an authority on the subject of moisture transport within building materials and systems. This entry was posted in Santa Cruz Architect and tagged building technology, design, exterior insulation, green building design, net zero building, net zero energy, net-zero energy building, NZE, NZEB, Santa Cruz Architect, zero-energy building on May 26, 2014 by santacruzarchitect. 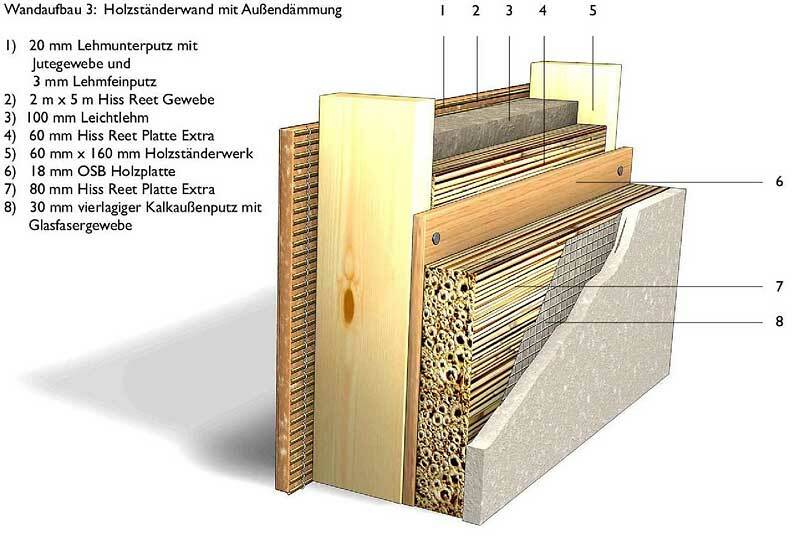 A proprietary wall system marketed in Germany which utilizes 60-80mm reed insulation as the exterior insulation material. The effective date for the 2013 California Title 24 Building Energy Efficiency Standards (a.k.a. California Energy Code) will be July 1st, 2014. This update requires single-family residential buildings to be 25 percent, multi-family to be 14 percent and non-residential buildings to be 30 percent more energy efficient than the previous 2008 standard. Under the prescriptive method, new requirements for the residential building envelope entail increasing the cavity insulation value from R-13 to R-15. Additionally, an additional layer of minimum R-4 rigid insulation will need to be applied outboard of the wall cavity. It should be noted that these requirements apply under the prescriptive method. Equivalent wall assemblies can be supported if they “pencil” out according to the building’s energy modeling analysis. That said, the addition of rigid insulation does vastly improve the performance of the wall assembly, and by 2016, will become a mandatory feature. So it’s best to understand the ramifications of so doing. 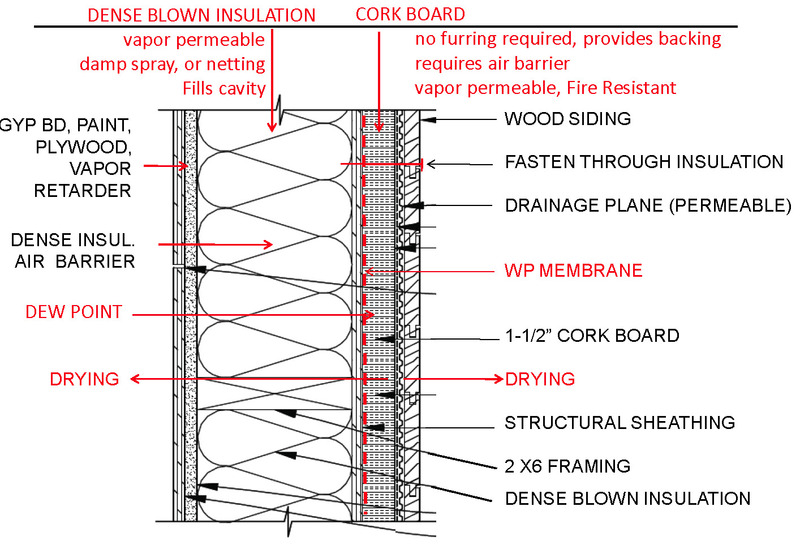 Diagram illustrating structural considerations of attaching finish material through exterior insulation (courtesy Siegel+Strain Architects, Emeryville). These considerations include: 1). selection of the appropriate rigid insulation, 2). method of attachment of the rigid material to the structural sheathing, 3). attentiveness to position of the dew point within the assembly and, 4). method of attachment of the finish material to the rigid insulation. The standard wall assembly currently in use has benefited from generations of trial and error to perfect. The addition of rigid insulation to the assembly is in its relative infancy. Thus, as yet there is no standardized approach guaranteed to perform reliably in the long term i.e. over the life of the building not experience any of the failure modes implied by the four considerations listed. 1). inappropriate rigid insulation: deterioration or delamination. 2). ill-considered insulation attachment: separation from substrate. 3). ignorance of dew point: liquid water within wall system. 4). ill-considered finish attachment: detachment or failure of finish material. The prudent builder or designer striding bravely into the brave new world of rigid insulation will do well to research quite carefully the appropriate wall assembly solution, one that performs as intended while avoiding the potential pitfalls inherent in the assembly. On March 19th, 2014 at ADPSR’s Better Envelope Solutions Showcase in San Francisco, architect Larry Strain presented a talk entitled, “Insulating Exterior Assemblies”. In it, he discussed in detail the nature of these concerns, options with respect to “green” insulation options in the assembly, together with an example of practical application in a realized project. The link is at: Insulating Exterior Assemblies. This entry was posted in Santa Cruz Architect and tagged architectural design, building technology, design, green building design, net zero building, net-zero energy building, NZE, NZEB, Santa Cruz Architect, zero-energy building on May 7, 2014 by santacruzarchitect.